Ever since ancient times, marble has been extracted from the Apuan Alps. Carrara has been acknowledged for the exceptional quality of its white or blue-gray marble and supplied the Roman Empire for the construction of the most prestigious monuments that make the glory of Rome. The word "Carrara" itself is made of the Celtic "kair" or its Ligurian form "kar," both meaning "stone". The double consonant R is likely to come from the French "Carrière" (quarry). 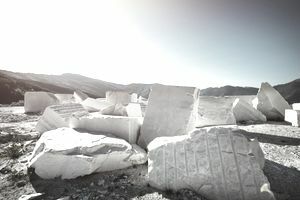 Due to its antiquity and production size, Carrara is a perfect case study for anyone who wants to study the evolution of the marble extraction techniques throughout the ages. The extraction work, mainly manual, was performed by a workforce largely made by convicts to forced labor, slaves, and Christians. The first miners exploited the natural fissures of the rock, where fig wood wedges were inserted and inflated with water so that the natural expansion caused the detachment of the block. For blocks of fixed size, usually of 2 meters thick, the Romans used the method of the "panel" practicing in the selected block, a 15-20 cm deep cut in which were inserted metallic chisels. After a continuous pounding, the block was finally separated from the mountain. The use of black powder became part of the Carrara marble extraction techniques during the Eighteen Century. The Apennine landscape went through a profound change. Large buildups of debris (called "ravaneti") showed how strongly the marble deposits were affected by the use of explosives. Decorative stone extraction techniques carry their own specificity where "the first concern is about not damaging the rock during the extraction, which would make it unsuitable for further use", as already mentioned in a previous article. The real revolution of the marble extraction techniques took place at the end of the 19th century with the invention of the helical wire and the penetrating pulley. The technique is based on a 4 to 6 millimeters diameter steel wire combined with the abrasive action of silica sand and an abundant amount of water as a lubricant. The helical wire is a continuous loop of tensioned steel that moves at a speed of 5 to 6 meters per second and cut the marble at a rate of 20 centimeters per hour. The use of this new technique almost completely substituted the use of explosives and determined a visible change in the landscape. The mountain began to be literally cut with precision, creating surreal landscapes made of huge flights of steps and platforms, called "piazzali di cava". "Diamond wire cutting was invented in England in the 1950s, initially by diamond electroplated beads threaded onto a multi-strand steel cable. Over the past 30 years significant development work (by Diamant Boart, among others) refined the concept until it was commercially accepted in Carrara marble quarries in Italy," wrote Shane McCarthy in a remarkable paper about diamond wire cutting. Diamond wire sawing is still in use today in the marble industry, especially in Carrara. The diamond wire sawing requires drilling initially two perpendicular holes (one horizontal at the base of the bench and a vertical from the top) which meet, according to the block size to cut. Then the cable is rotated by a machine placed on rails. By turning, the cable saws the rock. The machine backs progressively on the rails so as to keep the cable tensioned until the end of cutting. This technique is widely used as it allows for calibrated and easy to rework blocks with sharp edges.